We need to use an =HLOOKUP to complete the exam dates first. Excel will match on the centre name to find each date. Create an =HLOOKUP formula in cells E4:E23 to find the exam date for each pupil. 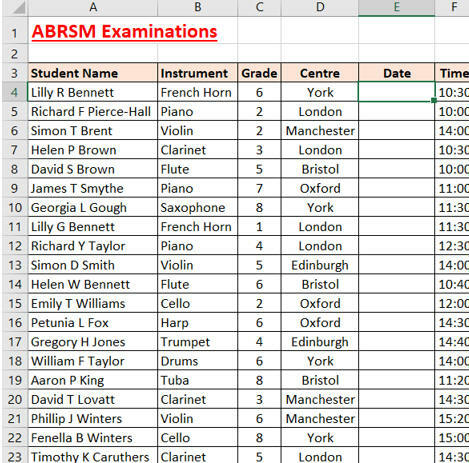 Excel will find an exact match in column A for the pupil name. First create a range name for all the data in your main spreadsheet table (A4:F23). Also create a range name for cell B26 where you will keep changing the pupil name. In cell B27 create an exact match lookup formula to return the instrument name from column B (the 2nd column in your lookup table). Copy the formula down to cells B28:B31 and then edit each formula by changing the column reference to return the correct pupil exam data. Change the pupil name in cell B26 to Petunia L Fox to check that all your formulae work.